If you’re looking for Montessori science experiments to enjoy in the classroom with your students, or need some boredom busters to keep your little ones learning at home, this collection of ideas will NOT disappoint. My husband and I decided to enrol our Sweet Girl into the Montessori system ~2 years ago, and it was hands down one of the best decisions we’ve ever made as parents. The small classroom sizes combined with the child-led approach to learning is perfect for her, and I have thoroughly enjoyed watching her confidence and independence grow over the last couple of years. She loves going to school each day, and I love that she is able to zero in on the materials she is most passionate about while still being challenged to dig into other, more challenging lessons. I also enjoy seeing all of the cool Montessori materials available to the children, and hearing all of the engaging, hands-on activities the class does each week. And since my daughter has always enjoyed doing experiments with me, I decided to collect some Montessori science experiments we can do at home together. Before we dig in, I wanted to quickly explain what the Montessori method of teaching is for those who are new to this approach to learning. Feel free to skip down to the list of Montessori science experiments and materials toward the end of this post if you’re already part of a Montessori-inspired school system! The Montessori system offers an alternative and individualized approach to education. Teachers – or guides as they are often called – introduce lessons and the children then decide which materials they wish to work on each day. Limits are imposed to ensure students complete each part of the curriculum throughout the year, and teachers provide one-on-one lessons based on the child’s academic abilities and interests. One thing I appreciate most about the Montessori system is that it allows for long, uninterrupted work periods – one in the morning, and one in the afternoon. This allows children to dig deep into their lessons, rather than just engaging with them for a short period of time. Why Is It Important To Do Science Experiments with Kids? With STEM education – a multifaceted approach to learning that combines science, technology, engineering, and math to develop a child’s problem solving and critical thinking skills while also encouraging creativity, communication, and teamwork – becoming an area of focus in classrooms around the world, finding ways to foster a love for science in our children is becoming more important than ever. Getting kids excited about science at a young age can have a huge impact on their academic growth and development, not to mention their career paths. As mentioned earlier, the Montessori system is very hands on, and these Montessori science experiments definitely support this approach to learning! How to Leaves Breathe? | Discover. Learn. Connect. How Much Water Is In Snow? | Discover. Learn. Connect. The Science of Sound Waves Experiment | Discover. Learn. Connect. If you’re looking for MORE Montessori science inspiration, check out these fabulous science books for kids! 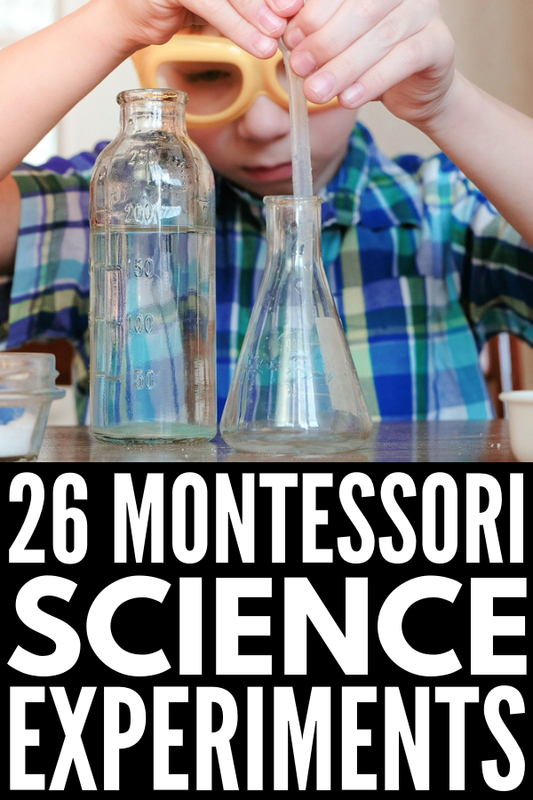 I hope you enjoy this collection of Montessori science experiments as much as we intend to! Remember that there is no age limit when it comes to getting kids excited about science. Start young, appeal to your little one’s interests and passions, make it hands on, and (most importantly) have fun! If you liked this collection of Montessori science experiments, please share this post on Pinterest! And if you’re looking for more education activities for kids, please follow our KIDS board where we share all kinds of great ideas we find each day!